All of us wants to be successful in every career we choose in life. Same for Overseas Filipino Workers (OFWs) because no one wants to work abroad forever! 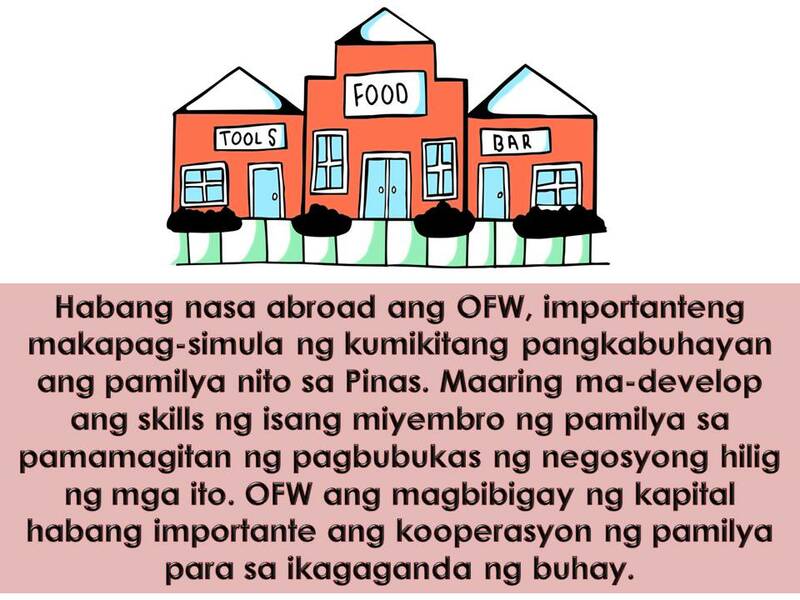 But if we look into our society, there are many OFWs come home broke or retired without single investment. If you are an OFW and want to be successful, consider this 10 tips. In goal setting, it is vital to include your family. Discuss with your family what you want to achieve while working abroad. For example in a year or two you, your goal is to put up a small business to help the need of the family or buy a tricycle or jeepney for an extra income in the Philippines. In five years you could start building your dream house etc. This goal for your family will serve as your motivation and inspiration to work abroad. Your family needs to know your goal so that they can help you achieve this for the good of everyone. Applying for work overseas needs money. Placement fees, payment for processing of documents, passport and medical certificate, training etc. Ask yourself first, where will you get money for this? Selling your house, selling a piece of land that your family owns? If working abroad means losing your families valuable properties, you might re-consider your plan. Getting or buying them back will eat a big part of your earning, making it hard for you to save for the future. If you want to be successful it is important that you know to "pay yourself first". This means, never forget to save a portion of your monthly salary for yourself. Saving 20 percent of your monthly salary is not bad. Do not send everything home. Your savings could save you from debt. It will serve as emergency fund too. 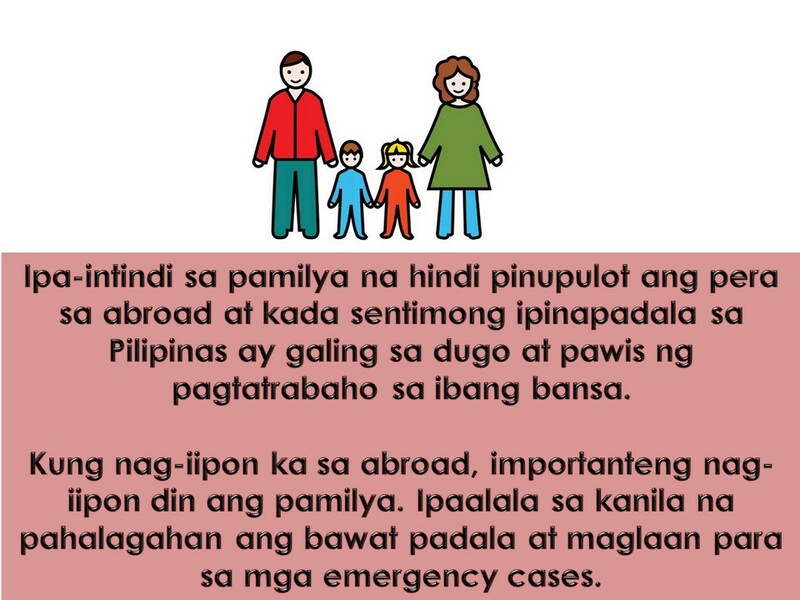 Our family at home often times runs to OFWs in case of medical emergency. But what happens if the OFW doesn't have savings? He or she will seek a help from loan sharks with big interest. 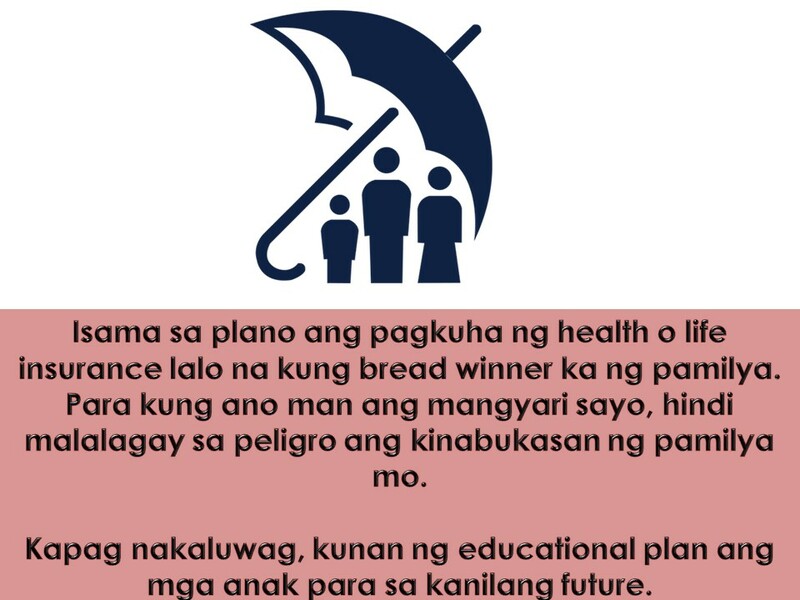 This is the reason why every OFW should a lot a small portion of their savings for savings. Your savings will now turn into an investment. But before venturing into something new. Every OFW is advised to carefully planned everything. If you want to buy a house, would it be a good investment or a dead investment? How about a car? What you turn your savings into a capital for a small business? How about franchising? 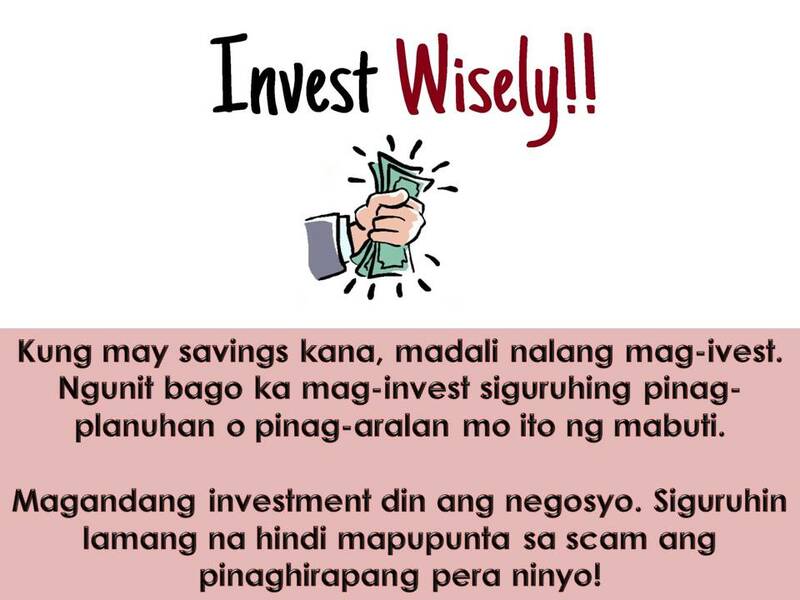 There's a lot of things to consider when comes to investment but make your you are not putting your money in a scam. 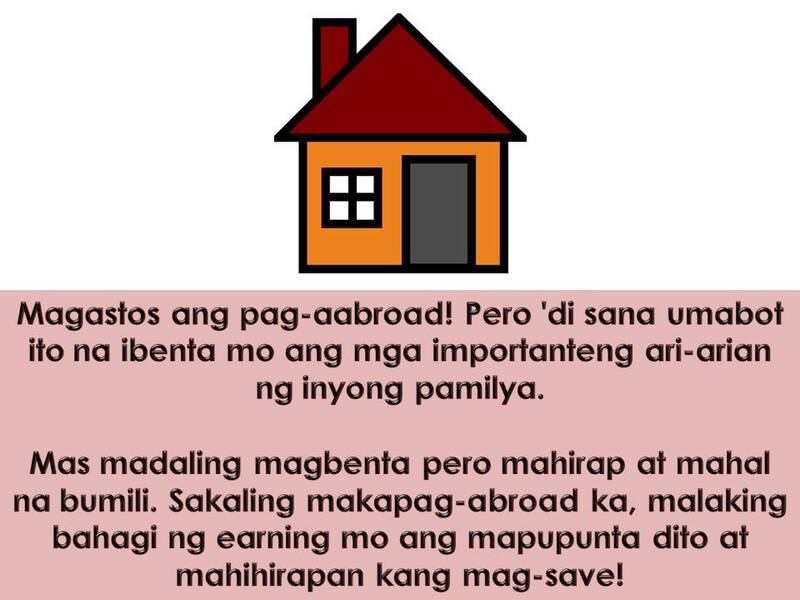 Read: 7 Payday Tips for OFWs To Save Money for the Future! 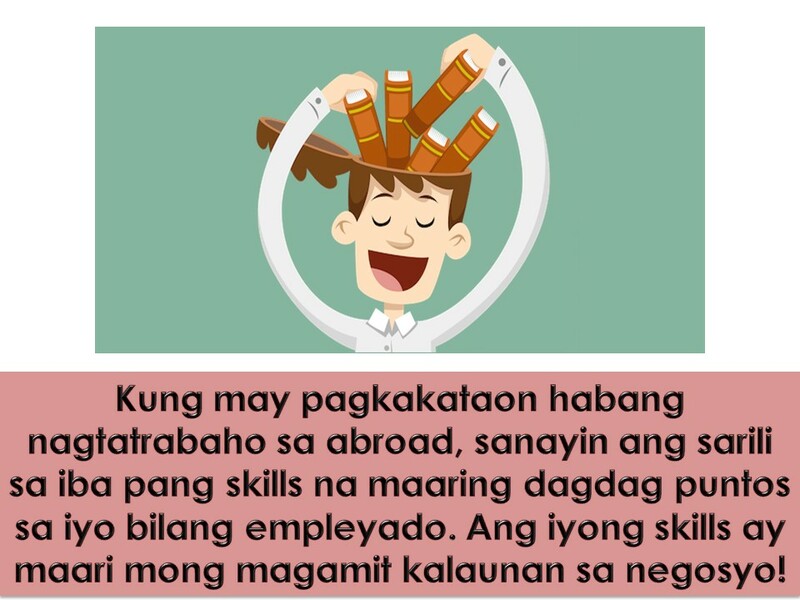 Since OFWs cannot focus or start a business in the Philippines while working abroad. It is important to seek the cooperation of the family. Business is a good form of investment if being managed well. Know the passion or skills of your family where you can mold some ideas for business. If your wife knows how to bake or make pastries, why don't you open for a small bakery. If someone in the family has the talent to cook then put up a Carenderia and so on. Sometimes talents are innate and people just need capital and guidance. Educate your family that every cent you sent home is a product of sweat and hard work. If you are saving for your self, your family should do the same. Remittances should be spent wisely and not in extravagant want. 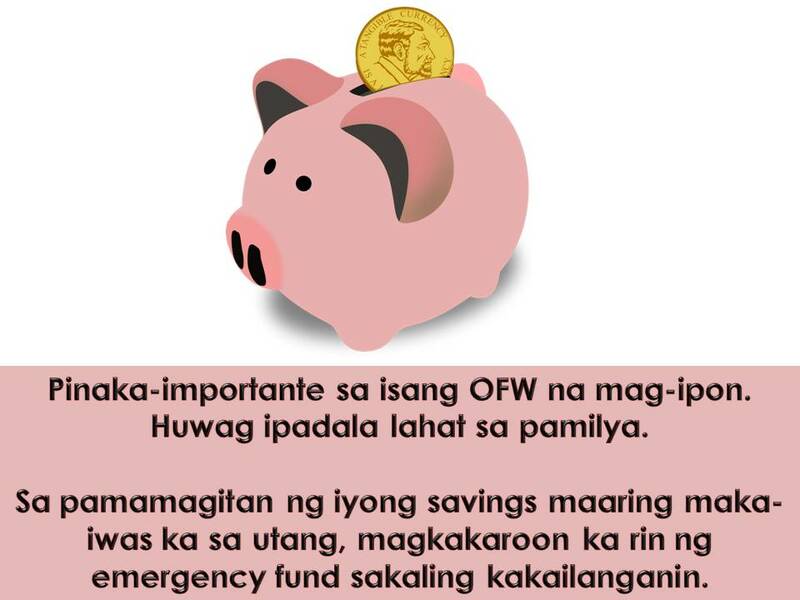 Remind your family to spare a portion of your remittance for an emergency. Also remind them about your goals together to that everyone can cooperate. 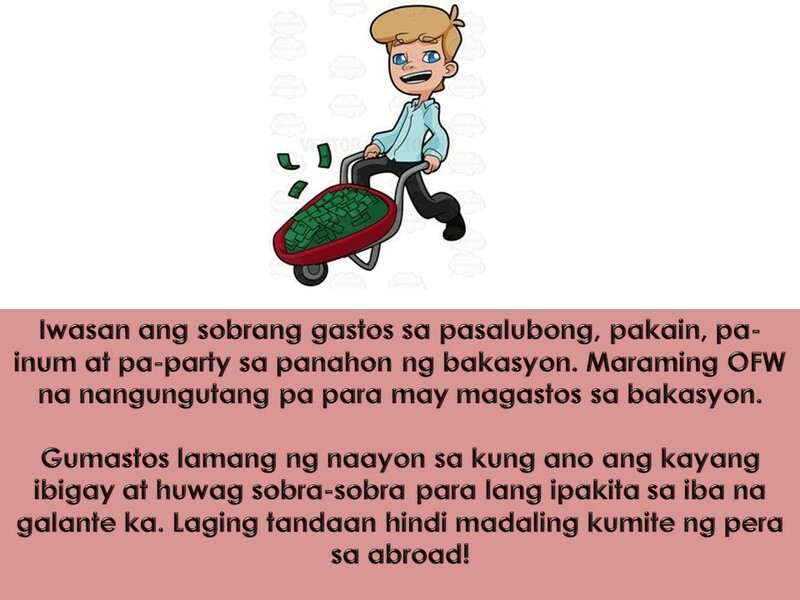 There are times OFW spend half or three-fourths of his savings for Pasalubong, Pakain, and Pa-inum while on Vacation. Pasalubong is normal but do not feel obliged to give presence to almost all people in your barangay. Avoid overspending just to impress other people. Some OFWs tend to loan big amount for their vacation so that they have money to spend with every people who ask for a "pasalubong". Remember, your mere presence is much important for your families and people who truly love you. No need for pretensions. If you serve as a bread winner for your family. Get an insurance for yourself. Ask this question, what will happen to my family if I am gone? Health and life insurance are important. If you are secured, you can start securing your children's future by getting educational plans for them. Learning a new skill is never a waste of time. It will add value to you as a worker and it will help you grow as a person. Aside from your goal, another motivation to work is simple reward for yourself. If you want something for yourself and you are saving and working hard for it, then you deserve it.